You’re viewing our Sausage Maker Insta Cure No. 2 8 oz. TSM created Insta Cure No. 2 for use when making dried, cured foods, including hard salami, geonoa salami, pepperoni, dried farmers sausage, capicola, proscuitti hams, and more. The cure should be used on products that do not require smoking, cooking, or refrigeration. 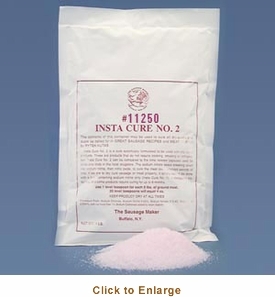 Insta Cure #2 works similar to time release cold capsules, the ingredient, the sodium nitrate breaks down to nitric oxide and cures the meat over time. Some meats can take up to 6 months to complete the curing process. When curing meat use 1 level teaspoon per 5 lbs. of meat. 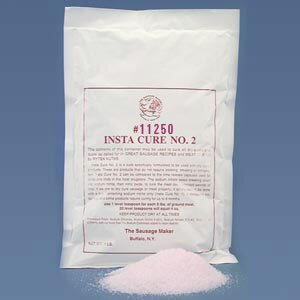 1 pound of Insta Cure processes approximately 240 lbs. of meat. We are available to answer any questions you may have about our products.